Recently I opened a box of 2013 Goodwin Champions in the rare hopes that I might pull the SP Mark McGwire auto. As expected, I did not get a McGwire auto, but instead I was surprised with an Art of the Ages 1 of 1. For those collectors who haven’t seen these cards, they are amazing. Each card is a hand painted replica of an original art masterpiece. 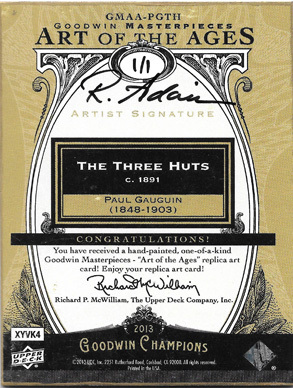 My card is a replica of Paul Gauguin’s The Three Huts, and it is cool. Up close it is very easy to see that the card is painted not colored. In places there are brushstrokes and texture from layers of paint. I took the time to compare the card to a picture of the original artwork and the two look very close. So, outside of being cool, what are the odds of pulling one of these beauties? Well, Goodwin Champions is loaded with case hits. At a rate of one per 16 boxes (320 packs), a collector has the chance of pulling one of four possibilities: Art of the Ages, It Came from Space, Museum Memorabilia, and The Elements. If you do the basic math, the odds of pulling one of these Art of the Ages masterpieces are huge. They turn out to be a one in four cases, or one in 1,280 packs, chance. This is a scan of the Goodwin piece. Although the colors are slightly off, the replica is very close and is an amazing recreation. The artist in my opinion did a fantastic job, especially considering the size of the piece. Good job UD, for a non-sport insert this is a really cool idea! I hope to see more of these in future releases. This is the original artwork by Paul Gauguin. The painting is a Cloisonnism piece and was painted around 1891 in French Polynesia. It is currently and tragically in a private collection.